Magic Leap's Creator Portal hosts documents and resources for developers wanting to create AR app experiences for the headset to read and integrate into their software. Requiring registration to access, the portal includes tutorials, reference documentation for the API, sample assets, blog posts, and other assistance to get developers up and running with the device. The main element of the portal is access to the Lumin SDK, which is offered as a "technical preview" that the download page warns lacks some of the features and functionality of the final release, and may also contain bugs and other defects. Technical preview packages are also available for use with the Unity and Unreal game engines, allowing developers with experience in the game-creation tools to quickly integrate the SDK into their apps. The features of the engine-specific release include support for hand gestures and key point tracking, detecting the environment as a mesh, detecting environmental planes, image tracking, eye tracking, and other graphical and audio-related items. A fourth element, Lumin Runtime, is not currently available, but is apparently "coming soon." The portal also mentions "Magic Leap World," an upcoming marketplace for developers to distribute their apps to other Magic Leap users. As well as providing content to end users, Magic Leap World will also apparently help development team members to collaborate on content ahead of their app's launch. 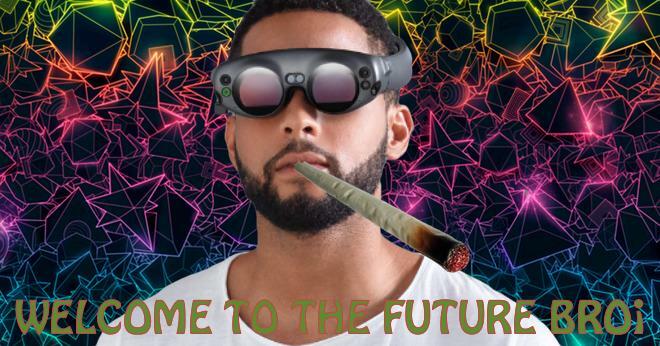 Long in development, the Magic Leap One consists of Lightwear goggles and a "Lightpack" wearable computer, which will be able to detect and respond to a variety of input modes, including head movements, eye tracking, gestures, and voice control. Few technical details about the hardware have been revealed, but the Lightpack is thought to be similar in terms of power as a MacBook Pro or a gaming PC. Founded by Rony Abovitz in 2010, Magic Leap has raised approximately $1.9 billion in funding as of the end of 2017. It took five years for the company to release footage claimed to be filmed through a Magic Leap-style device, then announced a partnership with Disney's Lucasfilm in 2016, but aside from a a few select developers, the company has kept the development of the device in-house and in relative secrecy. Magic Leap already has some competition in the AR market ahead of its expected release at some point in 2018. Arguably its biggest headset competitor is Microsoft, as after introducing HoloLens, it has since worked with third-party vendors to ship Windows Mixed Reality head-mounted displays. Apple has also stormed to the forefront of augmented reality in recent times, shipping the popular AR Kit framework for iOS developers to add augmented reality to iPhone and iPad apps. The company is rumored to be working on AR glasses or goggles, but in an October interview, Apple CEO Tim Cook's comments indicate there probably isn't an Apple headset launch happening anytime soon. And mark my words, this will be Apple’s next acquisition. There's a couple of techs with major investments in Magic Leap. As Gatorguy mentioned, Alibaba, Google, Kleiner Perkins and others are among those companies already invested in Magic Leap. I consider them the biggest vaporware company since the Moller Skycar. Interesting. We'll see what happens. Ha! And if that bulky, goofy looking headset is the best they can do after all this time, the vapor will continue. Despite their confusing name, Windows Mixed Reality headsets are not augmented reality, they are virtual reality. I think I've finally cracked this AR/VR thingy. For the life of me, I simply couldn't find any sort of use for this technology outside of gaming and entertainment. But it finally dawned on me: the VR grocery store. There's nothing I dislike more than a trip to the grocery store. But the truth of it is that I need food, and online shopping is a horrible experience. The apps and carts experience actually takes me longer to accomplish than driving a few miles to the store with a list, and doing it myself. And often, the wait in the checkout line is longer than the cruise through the store. I refuse to use a self checkout (unless maybe they offered me a 10% discount) because they just don't work. Once you know the store, you know where everything is, and more importantly, what the prices are, and what "sales" are real. Reduce that to a VR experience, and you've go something. Stroll the aisles, scan for the real sales. Put in the cart, pay, and give me an option to pick up at a loading dock at a specific time (frozen stuff needs attention) or delivery at a specific time. Even better if I can specify custom order stuff from the butcher, deli, or bakery.